A couple of days ago I was browsing the MAC counter and I decided to buy and try my very first paint pot and I have to say, I'm super happy with it. I'm a fan of Maybelline's color tattoos, but for some strange reason, the shade barely branted is not available in my country. So I went the other way, since I couldn't get the dupe, I went for the real thing. Bare Study is a champagny colour, a little bit shimmery and very pigmented. The thing I love most about it it the texture; it's super creamy and smooth to apply and really blendable, what made me think in the first place that it will smudge in no time. But after it sets, it stays put and doesn't budge. For me it's the perfect base colour, it's light and a bit shimmery and, since is a creamy colour, it looks good with any eyeshadow on top. If you like base colours and shimmery shades, I recommed this one to anyone with a MAC near. Hace un par de días, mientras chusmeaba el stand de MAC, decidí comprar y probar mi primera Paint pot, y debo decir que estoy muy feliz con ella. Soy fan de los color tattoos de maybelline pero por alguna extraña razón, el tono barely branted no está disponible en mi país. Así que hice las cosas al revés, como no podía conseguir la copia, me compre la verdadera. Bare study es un color champagne, con un poco de brillo y muy pigmentado. Lo que más me gusta es la textura, es super cremosa y suave y se aplica y difumina facilmente, lo que me hizo creer al principio que se iba a borronear y mover rapidísimo. Pero una vez que se seca, se queda donde está y no se mueve. Para mi, es la base de sombra perfecta, es color claro, cremoso y brilloso hace que cualquier sombra se vea bien sobre ella. Si les gustan los colores brillosos, le recomiendo este a cualquiera que tenga un MAC cerca. Have you tried this or any Paint Pot? how beautiful! Out of the color tattoos and paint pots, which do you prefer? Gracias por la recomendación, seguro que lo pruebo!!! i just looking for somtehing like this!! really nice! visit me and follow each other'?? This Paint Pot looks stunning! I am now your follower number 44.
oh I love anything shimmery!! 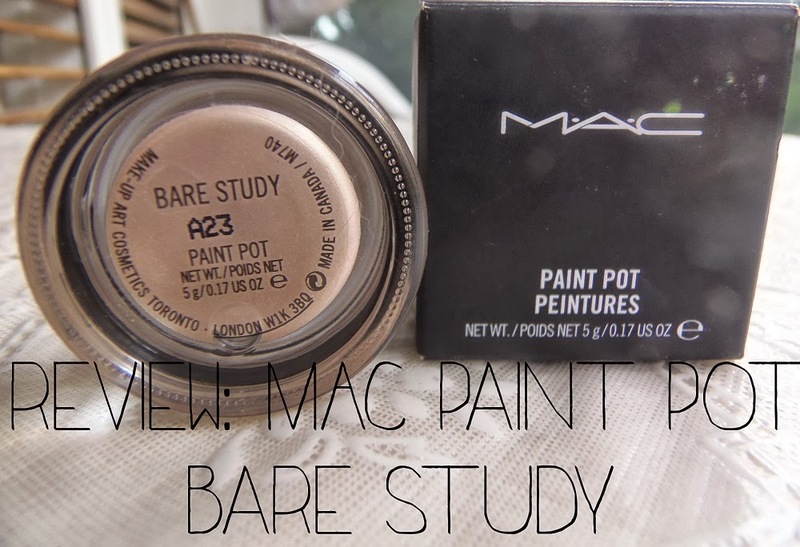 I haven´t tried it, but love all Mac Productos...this looks great! I´ll try it! I've NEVER tried a paint pot, that doesn't seem right! THis shade looks beautiful! That color is so pretty and very similar to a MAC eyeshadow that I normally wear. Thanks for the review! I've never tried this before but I'm loving the color. And now I'm dying to try it. Thanks for sharing. Beautiful color and natural <3 Want to follow each other on GFC? Sin duda mis productos de maquillaje favoritos: MAC forever! !